We officially have a wall surrounding TJS land. This may seem small to some but to us and our amazing supporters, we’re very excited to have a strong, secure wall around what will one day be our K12 permanent school. Two years ago, we opened the doors to our first class of kindergarteners at a rental property in Cabaret, Haiti. 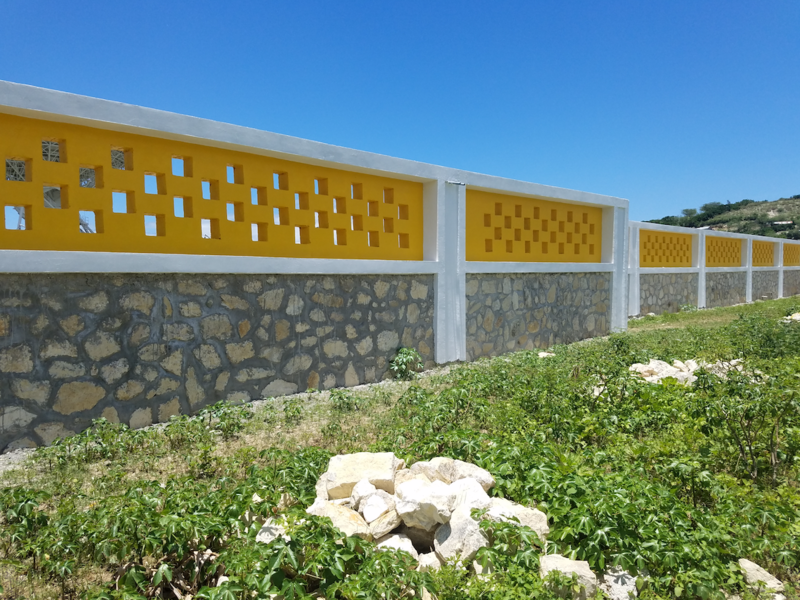 Because the Haitian government believes in The Joseph School mission, they gave us 20 acres of land to build a permanent school, and we are well on our way to making that building stand. We can’t open the school fully as that will take time and more help. But we are planning to open a section of the school a few years at a time. Since we currently have primary age students, that is the first section we hope to open this FALL! To do that, we need your help. Many of you have been very generous already. Some of you have asked when will more construction begin. Well the time has come. We’ve accomplished the wall and gate, and now we are moving to the building itself. If you can give to help out with construction, your gift would be very timely. If you cannot, we ask you to pray for The Joseph School, and the safety of the craftsmen building the school. God is doing amazing work in and through the school. We hope you will continue to be a part of this effort.